GET ON THE INSIDE TRACK – DIRECT FROM THE L.A. AUTO SHOW FLOOR! Founded in 1907, the Los Angeles Auto Show (LA Auto Show), is one of the most influential auto shows globally and is the first major North American auto show of the season each year. Each fall, the who’s who of the auto industry gather to unveil the future of mobility in the car culture capital of the world. Debut categories range from luxury SUVs and flagship sedans to new compact sedans. This year, the show will see more than 50 vehicle unveilings overall – take a look! Smart, capable, and adaptable: All-new Ford Expedition provides families generous space, connectivity and smart new technology for their next adventures. Its technology redefines how drivers and passengers consume entertainment in their vehicles, including wireless charging for mobile devices, USB ports in every row, a rear seat entertainment system that can stream live cable or satellite television via SlingPlayer, B&O PLAY audio, and WiFi hotspot that can support up to 10-devices. 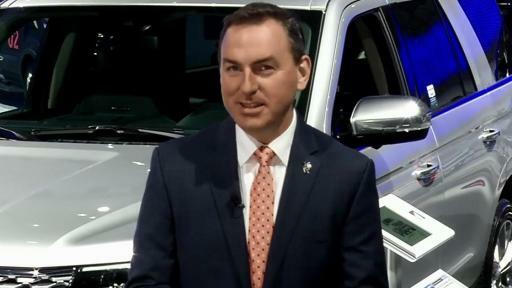 Perfect for families and Fido: Subaru unveiled the 2019 Ascent SUV in a special way – with the Barkleys – a family of eight Labrador and Golden Retrievers seemingly driving the all-new Ascent and ending, safe and sound, on-stage. This marks the automaker’s largest vehicle ever built with three full rows, fits up to eight passengers, a second-row captain’s chairs as an option on some trim levels, comes standard with Subaru’s legendary symmetrical all-wheel drive and EyeSight® Driver Assist Technology on all trim levels. It also features available Wi-Fi, Android™ Auto and Apple CarPlay™ compatibility, a stylish interior and exterior that follows Subaru’s “Dynamic x Solid” theme with powerful fender flares and a large, bluff grille. Sophisticated upgrades: The new Kia Sorento enjoys numerous exterior and interior enhancements to achieve a more refined and sophisticated look and comes with the choice of two proven engines, including a 2.4-liter inline-4 GDI or a 3.3-liter V6 GDI. Performance is elevated with available new 8-speed automatic transmission and revised 6-speed gearbox. It’s spacious with 7-passenger 3-row seating now standard on all trims. New Driver Assistance Systems are offered on the new model– Driver Attention Warning (DAW) and Lane Keep Assist (LKA). Sorento’s tech roster is expanded with Harman Kardon-audio with QuantumLogic™ and wireless charging. Bold features: The new Hyundai Kona offers bold, fresh design elements with optional two-tone roof and extroverted color options. It comes loaded with segment-leading available safety features such as Forward Collision-Avoidance Assist w/ Pedestrian Detection, Driver Attention Warning, and Lane Keeping Assist and premium technology availability such as Android Auto™, Apple CarPlay™, next generation Blue Link® and Wireless device charging.